Jamie Coombes at Sunseeker Torquay asks me to broadcast news of a £250,000 price drop on the 23.8m sailing yacht Ladisea. Drawn by the architects at Vallicelli design in Italy and constructed in Kevlar composite by Italy’s CN Yacht 2000 and delivered in 2009, this sloop-rigged yacht has been built to exacting standards. Ladisea is one of three 78 sloops built by the yard and boasts a generous inventory. The carbon mast and boom keep weight low adding to stability. 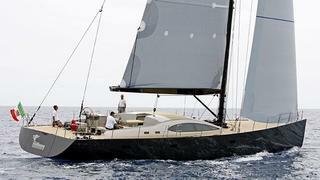 The Kevlar hull means this yacht is an extremely strong and powerful yacht for family cruising or competitive racing. Lying in Italy, Ladisea is now asking £3.25 million.